What is HomeoPet Wrm Clear? 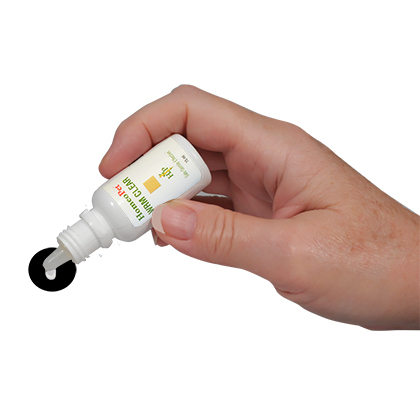 HomeoPet Wrm Clear is an all-natural, fast-acting, broad-spectrum homeopathic liquid, formulated to remove hookworms, roundworms, and tapeworms. It also helps prevent infestations by reducing susceptibility. 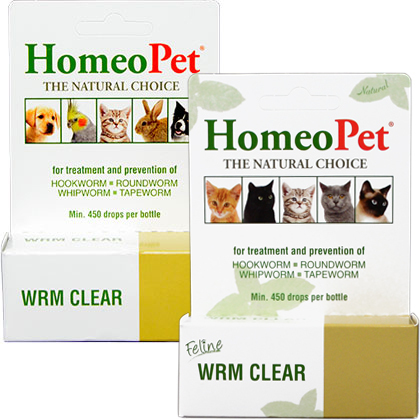 HomeoPet Wrm Clear creates an environment in your pet's body that worms can no longer survive in, resulting in the parasites being harmlessly flushed from the body. How does HomeoPet Wrm Clear work? Wrm Clear naturally removes worms with the help of granatum (pomegranate), which causes the expulsion of tapeworms. Kamala is also good for expelling tapeworms. Among the many other active ingredients that fight worm infestation is thymol, which is used against hookworms. It may take approximately 2 weeks for HomeoPet Wrm Clear to reach maximum potential. During this time, you may see live worms in your pet's stool. Live worms may be expelled from your pet's body up to 4 weeks following the last dose, as that is how long it takes for worm eggs to hatch. The effect of HomeoPet Wrm Clear remains active in your pet's body for up to 2 months after the final dose. There are no known side effects other than reversible effect of overdosage. Overdosage may result in a return of symptoms after the symptoms have initially disappeared. If symptoms return while you are administering HomeoPet Wrm Clear to your pet, stop administration to alleviate the effect. Although there is no evidence that there are any safety issues, extra care should always be taken when dealing with pregnant pets. Should a suspected adverse reaction be seen, consult your veterinarian or emergency veterinary clinic immediately. HomeoPet Wrm Clear should be used three times a day (morning, evening, and bedtime). Place directly into the mouth onto the mucous membrane. If this administration is not possible, the medication can be put in wet food, water or milk that your pet will finish. If your pet is sensitive to the odor of HomeoPet Wrm Clear, allow 10-20 minutes for it to dissipate before giving to your pet. Give HomeoPet Wrm Clear to pets for 14 days to remove worms. Pets who are hypersensitive to homeopathic preparations will show response to a single dose, which may not need to be repeated for some time. Therapy should always start with a single dose the previous day and should a major response be seen, therapy should not be recommenced until symptoms relapse. Then, only a single dose should be administered for maximum effect. Wrm Clear can be given directly into mouth, in water, or on food. Store this product at room temperature, out of direct sunlight, and away from strong odors. Keep out of the reach of children. Nat Mur, Nat Phos, Sulphur 6X, Arsenicum Alb, Nux Vom 8X, Calc Carb, Ferrum Phos, Silica Terra 12X, Chenopodium Anth, Filix Mas, Granatum, Kamala 3X, 3C, Cina, Spigelia Anth, Teucrium Mar, Thymol 4X, Cucurbita Pepo 2X, 4X, Triticum 3X, Naphthaline 5C In 20% Usp Alc. In Purified Water. Nat Mur, Nat Phos, Suph, 6X, Arsenicum Alb., Nux Vom 8X, Calc Carb, Ferrum Phos, Silica 12X, Chenopodium Anth, Filix Mas, Gran, Kamala 3X, 3C, Cina, Spigelia Anth, Teucrium Marum, Thymol 4X, Cucurbita Pepo 2X, 4X, Triticum 3X, Naph 5C In 20% Usp Alc. In Purified Water.